question_answer3) Show that, 2 and are the zeroes of the polynomial Also, find the third zero of the polynomial. 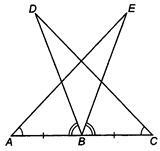 question_answer5) Simplify the following OR If find the values of a and. 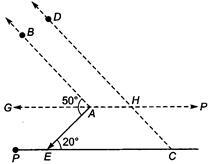 b.
question_answer6) What is the length of the side of an isosceles right angled triangle of hypotenuse ? 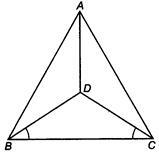 question_answer9) In figure, ABC is an equilateral triangle. 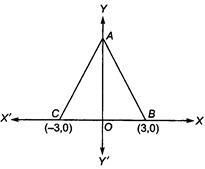 The coordinates of vertices B and C are (3, 0) and (- 3, 0), respectively. 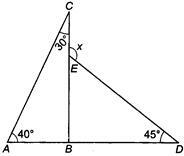 Find the coordinates of its vertex A.
question_answer11) In figure, show that State the Euclid's postulate/axiom used for the same. 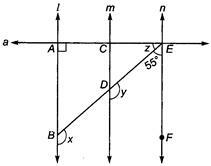 question_answer14) In the following figure, the measurement of ? 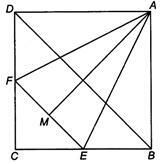 question_answer15) In the following figure, ABC is an equilateral triangle and BDC is an isosceles right triangle, right angled at D, then the measurement of ? question_answer16) Find the value of k, for which the polynomial has 3 as its zero. 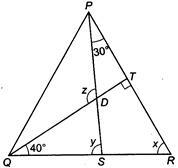 question_answer20) Find the area of a triangle whose perimeter is 180 cm and two of its sides are 80 cm and 18 cm. 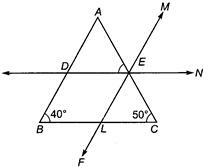 Also, calculate the altitude of the triangle corresponding to the shortest side. question_answer23) If has (x - 2) as a factor and leaves a remainder n when divided by (x - 3), find the values of m and n.
question_answer25) If A and B be the remainders when the polynomials and are divided by and respectively and find the value of a.
question_answer26) From figure, find the coordinates of the points A, B, C, D, E and F. Which of the points are mirror images in (i) X-axis (ii) Y-axis? 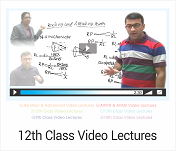 question_answer27) In figure, Find the values of x, y and z.
question_answer31) A traffic signal board, indicating 'SCHOOL AHEAD', is an equilateral triangle with side a. 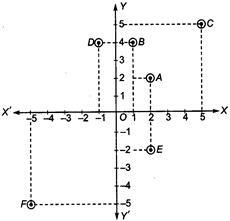 Find the area of the signal board, using Heron's formula. 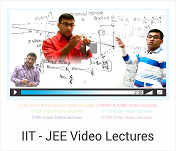 If its perimeter is 180 cm, what will be the area of the signal board? What message given by the traffic signal board for different type of vehicles?